Our spacious Ormond Beach Florida party buses are guaranteed to entertain you and your guests. They have amazing sounds systems, flat screen TVs, in motion satellite, multiple wet bars, and more! Select from one of our deluxe 18 or 40 passenger Ormond Beach party buses! 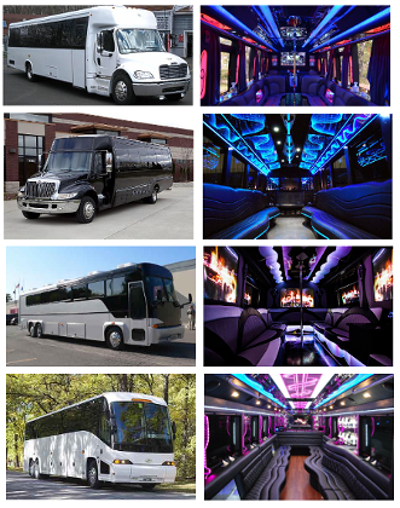 These party buses are great for bachelor / bachelorette parties, proms parties, wedding parties, birthday parties, tailgate parties, corporate events, or any special event you can think of. Give Orlandolimorental.com in Ormond Beach a call to get a free quote or to make a reservation. Orlandolimorental.com in Ormond Beach Florida provides airport shuttle buses, airport transfers, and airport transportation to all Central Florida airports and sea ports, including the Daytona Beach Regional Airport. We have Ormond Beach coach buses, shuttle buses, charter buses, mini buses, and luxury buses. We can meet all your large group transportation needs. Call Orlandolimorental.com in Ormond Beach for affordable rates and exceptional service.